Have you heard of Sierra Entertainment? Yes? Well I wasn't expecting another answer. But did you knew that they have risen to glory with the series King's Quest? No? I didn’t know it until recently too. For many years I have known Sierra as the guys behind games like Empire Earth and Caesar. Anyway believing it or not their golden series has been King's Quest and it is now alive again with the latest re-imagining by Odd Gentlemen and Sierra. But let's start from the beginning. 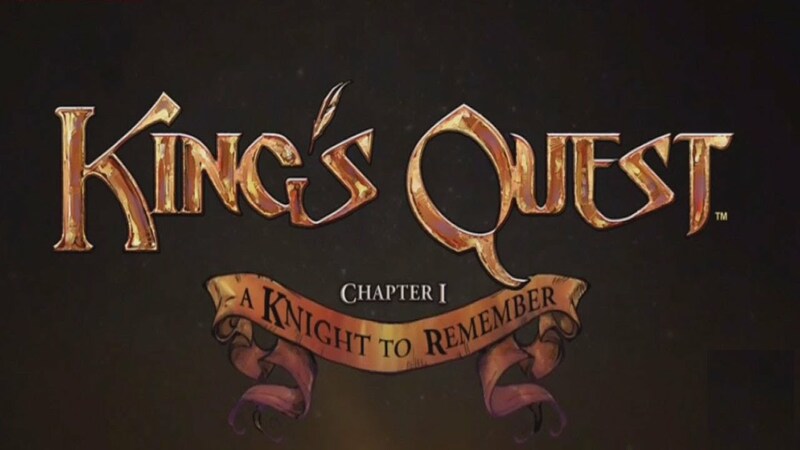 What is King's Quest, who is the King, why he gives quests to people? Disclaimer: I have never played the old King's Quest series, so I'll compare this one to other adventure games instead of its predecessors. If you're looking for an opinion how the new game is compared to the previous ones I'm afraid you will not find it here. In the five series re-imagination you will follow the story of Graham. From his hopeful knight exam up until the time he becomes King Graham. Now, now, no need for harsh words. It's not like I spoiled anything, you will learn this in the first minutes of the game. King's Quest itself is structured in way of a story - Graham tells his granddaughter her favourite story about how he tricked a dragon and stole his treasure - a magical mirror and returned it to the King who was so thankful that he made him a King. After the end of the story Graham's granddaughter is not satisfied though and he decides to tell her another one, one she has never heard before - the one of how he became a Hopeful Knight. Honestly there is not much to say about the game. King's Quest even re-imagined is a classic adventure game. You walk around talk to people, they request certain item from you, you hunt for it, solve puzzles, bring them what they need, they give you new item and ultimately you complete your main objective. By its spirit and mood the game reminds me of another classic and that is Monkey Island. There are differences of course, like Graham is a lot smarter than Threepwood for example. Not to mention that the series has more action in it, well not as much as other similar games like Wolf among Us. But I divert, KQ remind me of Monkey Island, because of its silliness and goofy characters. For example the royal guard which after being chased by bees jump in the water one by one only after they're attacked by the bees. Or...I'll actually let you find the others on your own. Also as I already mentioned the mood of the game is light and without much tension. The humour of the game is also of similar "not-laughing-out-loud" type but more like "smirk knowingly". A type that I have started to like more and more. True, there is fail state in the game but when you die the game brings you in front of the giant mirror where your story is displayed while you tell it and old Graham or his granddaughter says something along the lines of "This is not what happened" and then the game brings you back to your latest checkpoint. Their remarks about your mistakes are mostly witty and funny but not many and they quickly become repetitive (or I just failed too many times). Will you fail as much as me? Well it depends how good you are at QTE segments. The puzzles probably will not give you any trouble as they are not really hard. For comparison Book of Unwritten Tales 2's ones gave me a lot more trouble. The big issue that you will encounter is that you will need to walk around a lot. This first episode is a lot bigger than other episodic games. But the problem is not the wandering itself but the fact that for some reason Odd Gentleman has not included a map in the game or any matter of traveling fast between locations, so be prepared to get lost. A cool thing that they did and is related to the puzzle solving are the multiple solutions with different consequences. For example when you need to find a new wheel for a cart, Graham goes in search for something round and you might steal a shield or a table...or you might even buy them, this choice also has its own consequences. Which only show how much more thought the developers have put in the puzzle solving than it looks. Another thing that I like in the new King's Quest is the aesthetic. The game looks like a fairy tale of high quality and style. The animations are nice, detailed and with good variation. The colours are vibrant and bright. And while we are at this matter the voice acting is at top level too which is great bearing in mind that there is a lot of talking going. As someone who has never played the old King's Quests I came to this game without any expectations. And I left impressed and inpatient for the second episode. King's Quest is a lot longer and meatier than other episodic adventure games and I find this fantastic. Also the game has great aesthetic; it truly brings you in a fairy tale. A silly one, but greatly voiced. 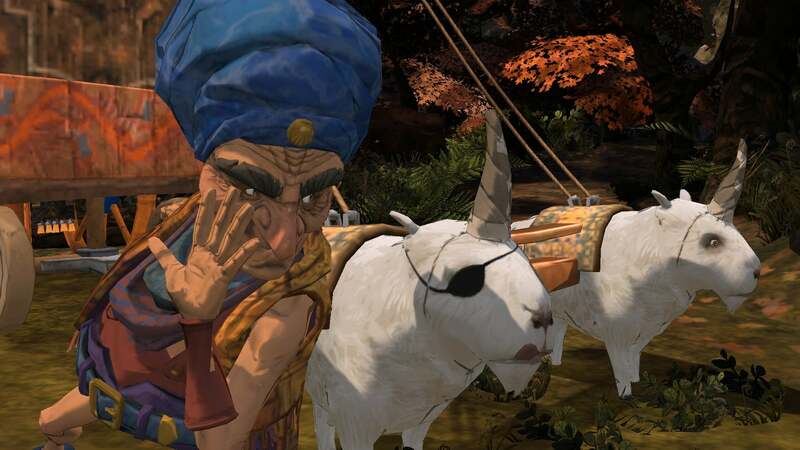 In other words King's Quest does great job in immersing you in the tale. The game is also not trying to be something that it is not and its jokes while not hilarious definitely bring exactly the right amount of humour. Under all this for good or for bad you will find a classic adventure game. Graham with your help will help people...creatures...characters to get certain items, then they in turn will give him items that will allow him to advance the story. And this will repeat until the fulfilment of the main objective. I cannot miss to mention that the Odd Gentleman has gone a bit further in puzzle solving when they have made some puzzles to have more than one solution, each with different consequences. This logically brings also more than one end to the episode. Now the classic aspect that I mentioned combined with the size of the world that you roam and the lack of map creates a problem. You will go by foot trough the same places quite a lot and this may be a problem even for the biggest fans as it become tedious quite quick. Sadly even if it sounds like a small problem it is a rather big one as it breaks the immersion and turns the game into a choir. Luckily this is the only real problem of the game and if you can look past it, King's Quest 2015 is an adventure game that if you are a fan of the genre you cannot miss. I hope that in the next episode they will fix what they have missed in this one and will allow this great otherwise game to shine in it’s fullest. Публикувано от Sharki в 14:08 ч.